Hey everyone, Happy New Year! Today is the first day back to Learn to Skate, and I hope you all are just as excited as I am to get back on the ice and learn new skills. This week I decided to focus on crossovers, one of the basic yet most important elements of figure skating. I begin every Learn to Skate lesson with forward and backward crossovers, and I often receive complaints from my students. "What is the point of crossovers?" they ask me. I can relate to the annoyance they feel about practicing crossovers every session, as I also despised them when I first started skating. However, it is important to understand that crossovers are a necessity of skating- all skaters including elite athletes and professionals need to know the proper technique of crossovers. Crossovers give you speed, help you transition between elements and are the leading element into every jump and spin. It is so important to properly do crossovers in order to acquire good basic skills and become a strong skater. Take time this weekend to watch the US National Skating Championships and notice how much every skater uses crossovers throughout their programs. As with any new sport, the start of Learn to Skate attracts many excited yet confused parents. If you are concerned about properly tying skates, don't worry - you're not alone. It is definitely a complicated process - they are often too tight, too loose, wrong size, etc. It is important to tie skates properly because it will affect your child’s experience on the ice. I often have to retie skates for students during the lesson and this is counterproductive because it wastes time and takes my attention away from other students. Each lesson is only 30 minutes, so in order to maximize the little time we have, all students’ skates should be tied properly before the lesson begins. Tying the skates is extremely important in terms of providing comfort as well as ensuring the efficiency of the skates. Skates that are too loose can cause wobbliness and the risk of a twisted ankle, while skates that are too tight may prevent proper foot movement such as bending and pushing. To begin with, make sure you receive the correct size rental skate and that your foot fits snugly inside. There should be room to wiggle your toes, however not too much room that your entire foot can slide around. Begin with the laces closest to the toes and tighten them by pulling until it is secure. These laces are only meant to keep your foot in place, so they do not need to be extremely tight or constricting. Tie each lace slightly tighter than the last as you go up the boot. When you finish tightening the laces, you will reach the ankle which is the most crucial part of tying skates. The ankle requires the most support so it is important to make this as snug as possible to prevent any foot movement on the ice. After tying a secure knot on the ankle, work your way up the remainder of the boot by looping the laces around the hooks. These laces should be tight as well since they will prevent the skaters’ foot from shifting on the ice. When both skates are finished, make sure your child is capable of bending his/her knees and walking properly. There should not be room for the heel to lift while walking, but there should be room for toe movement. Listen to your child and adjust his/her skates based on how tight or loose they feel they are. As usual, the skaters’ comfort is of utmost importance. First Day ...What Do I Wear? 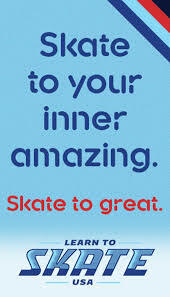 Today is my very first blog entry and also the first class of a new Learn to Skate session. I'm so excited to start blogging (yet nervous too) and to meet my new students and parents (and also to have my old students/parents back with me)! The first class is usually the craziest and most confusing, therefore it is important to arrive at the rink early so you and your child have ample time to check in, lace up your skates, layer up and meet your instructor. Make sure you have your child come prepared to class with warm clothing. I don't know how many students I've taught who don't wear jackets and gloves/mittens on the ice and they get so cold by the first ten minutes of lesson and lose focus and concentration and consequently, don't learn much during the rest of class. Wearing gloves not only keeps your child's hands warm but also provides protection in case he/she falls and we all know, falling is highly likely when learning a new skill. I recommend buying inexpensive gloves and having more than one pair in your bag because kids seem to often lose or misplace their gloves easily. It's also a good idea to layer clothing and have a jacket so that your child can take off when he/she starts moving a lot and his/her body temperatures get warmer. It's best to wear clothes that your child is comfortable in and will allow him/her to easily move and stretch. I always see one or two kids wearing jeans to class. I highly recommend no jeans because it can be bulky and too constrictive and conforming to legs that it does not allow your child to move freely on the ice. Also skating in wet jeans can be very uncomfortable and again, it's all about staying warm and comfortable to have a good lesson. Sweatpants or leggings are also appropriate and I would recommend snow pants to be worn over them to protect your child from getting cold and wet when falling. In addition to jacket(s), gloves and appropriate pants, it's important to wear thin socks. Thin socks are better than bulky ones because it allows your child's skates to fit snug around the feet and also avoids having any potential bumps inside the skates. Don't worry so much about your child's feet getting cold because there's ample insulation from the skates. I also don't recommend cotton socks because the fabric absorbs moisture when your child's feet sweat so he/she will have cold and wet feet which leads to discomfort. A good fitting bike, ski, or hockey helmet is also highly recommended if your child is under 6 yrs of age. Even older kids are encouraged to wear helmets, especially if it is their first time on the ice. Forgetting any of these essential items can negatively affect your child’s experience on the ice as comfort and safety are extremely crucial aspects of skating. So be prepared and your child will be happy and sure to have a great time learning new skills and tricks! Wow, my first blog post and it was not super complicated at all …actually, so fun! I’m really happy I can impart my knowledge and inspire others of my skating passion and hope I can truly make a difference. Thanks for reading!